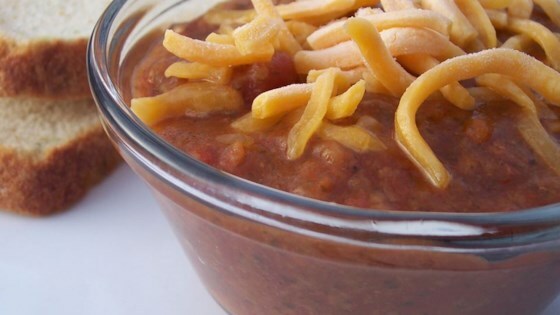 "You're not going to believe how awesome this chili tastes and how easy it is to make. I make batches and take it to work for lunch for the week. It's really filling and very healthy. You can substitute the chili beans with kidney beans if you wish, but be sure to drain them if you do. It's even better the next day, and if you omit the optional cheese, it's vegan-friendly!" Mix the tomatoes, onion, white beans, chili beans, taco seasoning mix, and ranch dressing mix in a large pot over medium heat. Bring to a boil. Reduce heat to low, mix in the burger crumbles, and continue cooking until heated through. Top with cheese to serve. Very salty and lacking in vegetables. I made this because I had all the ingredients on hand and didn't have time to go to the store, but I would not make this again. It was really amazing how well it came out. I used 1/2cup barly instead of the fake beef and added a little bit of chili mix. All in all, amazing! I really like this recipe, the ranch spices really help make it stand out against the typical chili I make. Yum! Used the Ranch Dressing and Dip Mix (2 tbsp) and Taco Seasoning I (2 tbsp) both from allrecipes. Excellent chili!